Happy International Coffee Day!! What's not to love about a steaming cup of joe?! I'm so happy to participate in today's Coffee Lover's Blog Hop along with about a gazillion other crafty peeps who share a "warm affection" for the caffeinated karma coffee provides. 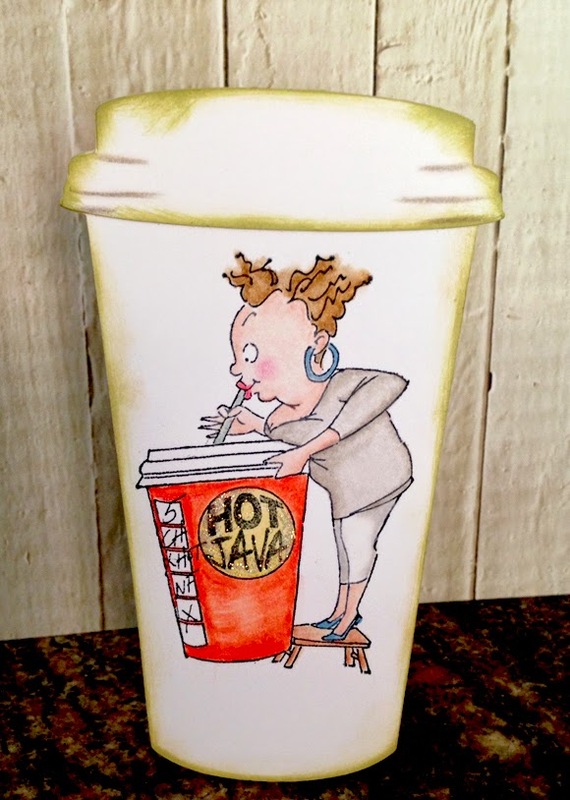 Here's my ode to joe -- an Art Impressions favorite of mine -- Cathy Caffeine! I stamped her on a To Go cup-shaped card front made on my Silhouette Cameo and just smudged the edges with some Distress Inks in Shabby Shutters and Tea Dye to give the cup a well loved look. Then I had to sparkle up the HOT JAVA logo with some Stickles. 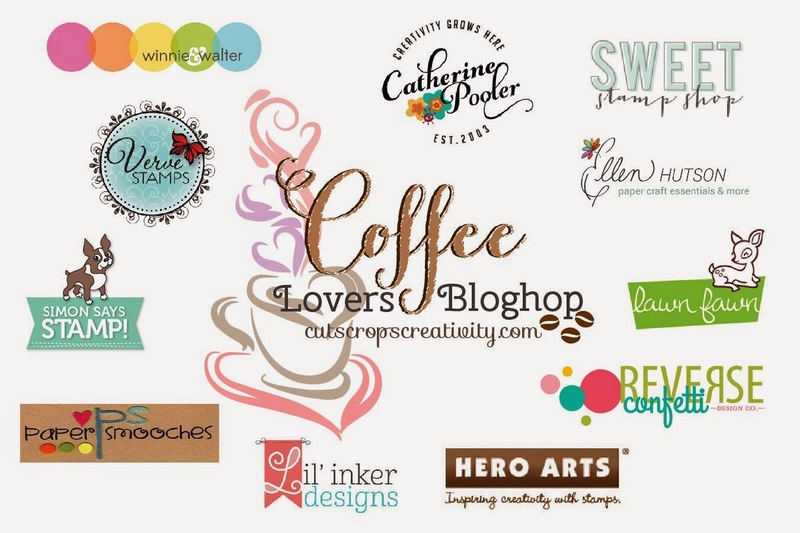 Be sure and check out all the fabulous coffee themed creations on the Coffee Lover's Blog Hop...thanks Chaitali and Amy! This is so fun! I love it! This is too cute! I love that it's shaped like a hot to-go cup, and that image...perfect! Hope you have a very happy caffeinated day! OMG, I got to get a hold of this AI stamp. Your card is totally awesome! 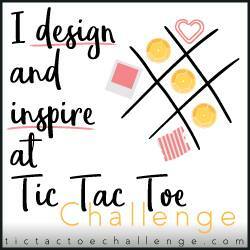 I am a bit sad I did not know about this blog hop in advance. Happy coffee drinking day to you and all java lovers. Finishing my second cup with a piece of home baked zucchini bread made with our own zucchini. Cheers! Shannon! I'm so in love with your shaped card. Love that AI stamp!! I love this stamp. Another one to add to my wish list. Amazing coloring! What a fun shaped card! Love the fun image, she is great! Shannon this is fantastic, gave me such a chuckle! Hope you are doing well my friend! Such a cute stamp and project. I have every one of those real cups in your photo. For the love of coffee!!! Love her...your card is so cute!! Amazing! Your card just makes me smile - super fun! Love this card, it warms my cockles while bringing a smile to my heart! 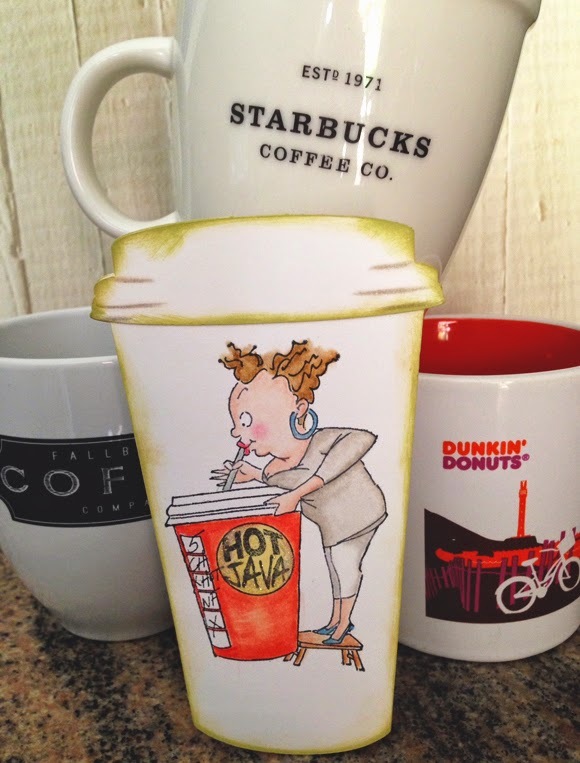 How fun that you made a coffee shaped card, then stamped a coffee image on it. oh my goodness that is fantastic!!! this card definitely put a smile on my face! Soooooooooo fun!! I love it!! I love Impression Obsession stamps! This is an awesome card! Love that you made a coffee cup shaped card. So cute. Your image is just so funny it made me smile. Shannon, I LOVE it! What a totally fun shaped card and I just love that stamp you used....toooo CUTE! You know that I LOVE it when you post on your blog! So cuter and I love you collection of mugs. Boxes, Bags & Tags, Oh My!